Ah, Christmas break: the one time of year I refuse to set my alarm and allow myself to sleep until my body feels it’s had enough. I’ve been sleeping till 8 am the last few days which may not seem late to you, but when 5:30 am is your usual wake up call, 8 am feels like noon! It’s been a restful and relaxing two weeks, although the achiever in me is officially ready to get back to accomplishing more than binging Netflix’s Manhunt: Unabomber series. What a fascinating show, though. I had heard of the Unabomber. I remember seeing his sketch as a child, and since my mom worked for the U.S. Postal Service, we paid attention when his devastating crimes were on the news. I knew he mailed bombs and successfully remained anonymous for 17 long years, but I had never heard the story of how the FBI caught the twisted recluse. The study of human speech including the units, nature, structure, and modification of language. FBI profiler, James Fitzgerald relentlessly studied the Unabomber’s 35,000-word manifesto–the structure and nature of his words. He studied how he phrased things, how he spelled things. And based on his language alone, the profiler was able to predict how old the bomber was, where he grew up, that he lived cut off from the rest of the world, and when he received his Ph.D. All of that and more, just based on studying his type-written words. Fitzgerald believed that if the manifesto were published, someone, somewhere would recognize the language and turn the Unabomber in, and he was right. A woman read the manifesto and immediately recognized the language from letters her husband had received from his brother. Could the Unabomber be her brother-in-law whom she had never met? She turned him in as a suspect and handed over a box full of letters Ted Kaczynski had sent to her husband over many years. After matching up words, phrases, and timelines, the FBI got their search warrant which led to Ted’s arrest and a lifetime behind bars. This was the first search warrant in history based on forensic linguistics. Kaczynski was the first man in the history of the United States convicted on language clues. Language is very much a part of who we are. The words we say and the way we say them represent our age, our ethnicity, where we grew up, and what we know. I used to confuse my husband when we were dating when I started talking about crayons because I pronounce them “crowns.” He thought it was just a weird Sarah word, but the more he got to know my family, he realized we all say “crowns.” And it doesn’t end there; it seems that everyone who grew up in East Tulsa says it the same way. Josh was a South Tulsa kid, and it’s easy to tell when he says “Cray-ons” all fancy like. I’m sure you can think of specific words or phrases you say, that would be concrete enough evidence to prove you were a 90s kid, an avid C.S. Lewis reader, a west-coaster or an east-coaster. But what about a Christ-follower? Is your speech, your writing, the way you string words together, concrete enough evidence to prove your devotion to God and His way of doing things? Whatever we do or SAY. God’s Word is clear: our words matter. If a linguistics expert were to study you, combing over the 20,000 words you say in a day, would they conclude that you were just like Jesus? Do the words that come out of your mouth or off of your fingertips represent Jesus? Every word Jesus said was full of truth and grace. His words were deliberate, thought through. Full of hope. He was never talking just to hear Himself talk, but to set captives free. Everyone could tell He wasn’t from around these parts. He was always talking Kingdom. His words were futuristic and confident, but not prideful. He was honoring–so, so honoring of His father. He spoke love, and he never complained, like ever. He was full of wisdom and perfect advice. He used his speech to encourage. I could go on and on about the beautiful language of Jesus, but I think this statement from Him sums it all up. If everything we say is meant to represent Jesus than everything we say should be spirit and life. And because Jesus has sent the Holy Spirit to flow in and through us like a mighty river, we have everything we need to represent Jesus and represent Him well! I’ve noticed when I speak spirit to spirit with my kids it goes over so much better than when I speak from my flesh to theirs. My flesh accomplishes nothing. I can yell and be annoyed and tell them to stop being mean to each other, or I can ask the Holy Spirit to speak through me as I sit them down and purpose to represent Jesus and get to the root of the issue at hand–whether it’s jealousy or someone just being tired and hungry. When I speak life over my husband, he receives it. He soaks it up. It charges him to step right on into whatever God is calling him to do. But when I speak death the opposite happens. Spirit and Life or Flesh and Death? You get to choose. You get to decide how you’ll string words together this year. You get to decide if you’ll let your flesh lead the way in your day-to-day conversations or if you’ll allow the Spirit to work through you. You get to decide if you speak death over yourself by agreeing with the lies of the enemy or if you speak life by agreeing with the promises of God. The choice seems obvious to me, but just because it’s obvious doesn’t mean it’s easy. It’s not easy. It’s humanly impossible to represent Jesus with whatever we say or type this year, unless, we decide to let Him do the heavy lifting. Matthew 11:29-30 Take my yoke upon you. Let me teach you, because I am humble and gentle at heart, and you will find rest for your souls. For my yoke is easy to bear, and the burden I give you is light. If you’ll accept this holy burden to speak spirit and life and allow Jesus to be your teacher, you can genuinely represent Him to every person you come in contact with this coming new year. And that’s good news because what the world needs is more of Him and less of us. Remember, language is very much a part of who we are. The words we say and the way we say them represent our age, our ethnicity, where we grew up, and what we know. 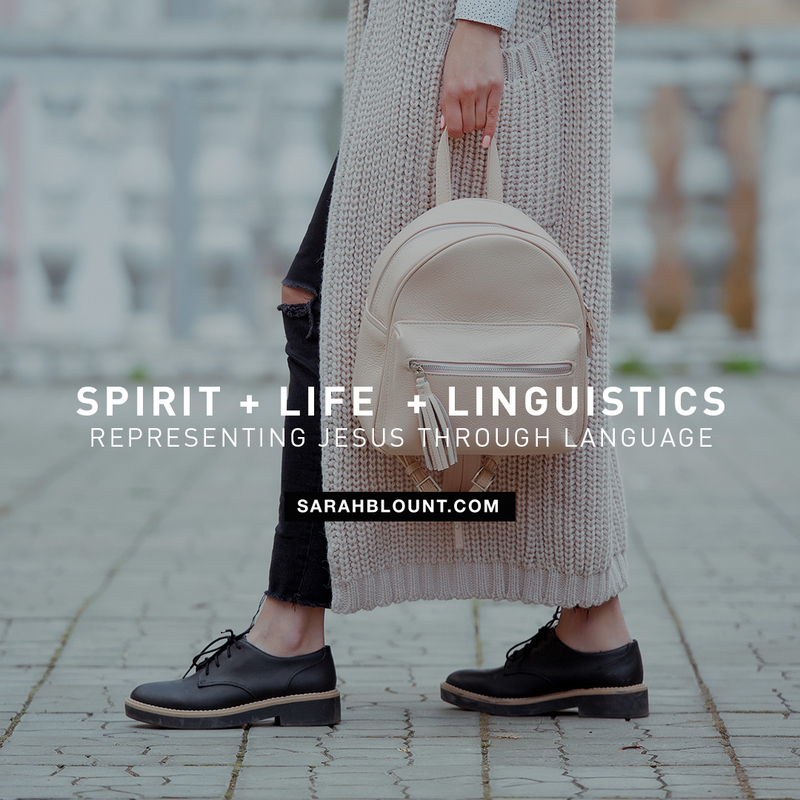 May our language represent Jesus and everything good and perfect that He stands for. Spirit and Life, friends, Spirit and Life!